BOATERS on the Wey in Guilford were amazed to see trees already in 'bloom'. 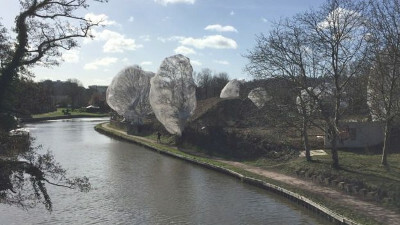 But alas it was not real, but trees covered in netting to stop birds nesting so that the trees can be cut down to make way for development, Keith Gudgin reports. Altogether 11 trees have been so covered, as it is illegal to disturbed nesting birds, so developers Sladen Estates have craftily covered the trees in netting to enable them to be felled without breaking the law. 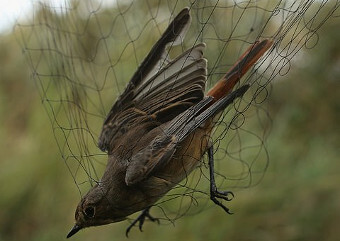 However the local council leader told that the move to put nets over trees on a derelict site in order to develop it was 'wicked' and endangers wildlife. Developer Sladen Estates, intends to build 191 homes on the site, but Simon Cowell, from Leatherhead-based Wildlife Aid, told the process is incredibly dangerous, even on the outside, with birds able to get their feet stuck. "Netting those trees to avoid any potential disruption to a developer I thought was unacceptable. This was not a particularly clever move by the developer as it has just highlighted to everyone involved in the decision-making process the potential plight of those trees."